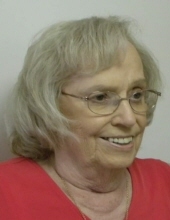 JOHNSON, Mary Sandra "Sandy" - Age 79, of Gaines, died November Friday 16, 2018. A memorial gathering will be held 4PM-6PM Sunday December 30 at Sharp Funeral Homes, Miller Road Chapel, our temporary location, at Hill Creek Church 5363 Hill Rd., Swartz Creek ( Mundy Township). Sandwiches will be served. Mary was born in Flint the daughter of the late Howard Arthur and Amelia Marie (Zimmeman) Griffith. She married Gary Joel Johnson in Flint on March 31, 1973. Sandy retired from Hurley Medical Center with 20 years of service and owned and operated Johnson Stables with her husband for over 40 years. She was a harness horse trainer, who raced, raised and bred horses. Sandy and Gary trained Shoe In, the top two year and three year old harness race horse for the State of Michigan in 2004 and 2005. She loved dogs, quilting, and she loved attending dog shows. She was a volunteer at the Durand Rehab Center. Surviving are: husband of 45 years Gary of Gaines; children, Gail (Steve Bonin) Johnson of AZ, Pamala (Hugo) Flores-Alvarado of Davison; Tributes may be posted at www.sharpfuneralhomes.com. To send flowers or a remembrance gift to the family of Mary Sandra " Sandy" Johnson, please visit our Tribute Store. "Email Address" would like to share the life celebration of Mary Sandra " Sandy" Johnson. Click on the "link" to go to share a favorite memory or leave a condolence message for the family.